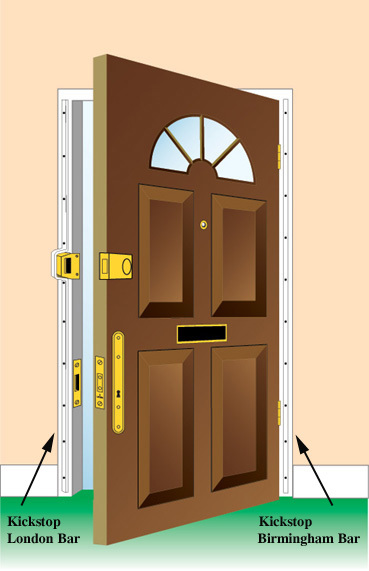 The London Bar is a door frame reinforcing bar with a 'D' shaped staple to fit over and secure the staple (keep) of a surface fitted rim lock or cylinder nightlatch. This very effective steel anti-burglary device is screwed on to the internal face of the lock side of the frame and will resist the kicking, splitting and forcing open of the door. 'UNIVERSAL' size 'D' shape staple to fit over lock staple/keep which is 30mm x 97mm - or less.